Independent research is a powerful way to learn. 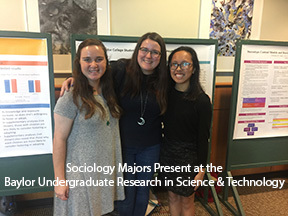 Baylor sociology faculty routinely work with undergraduate student on research projects of mutual interest. What sociological questions would you like to answer? SOC 4V70 Independent Study permits qualified students to earn credit for research. The expectation is three hours of work per week for every one hour of course credit. Students typically take SOC 4V70 for three credit hours and invest approximately nine hours of weekly effort. Research culminates in a product, such as a paper, research poster, and/or a formal research presentation. Independent research and the resulting product are valuable assets for graduate school applications. The independent research projects of prior students have been presented at the Baylor URSA Scholars Week, Southwestern Social Science Association annual meeting, and other professional conferences. In addition, several research projects have been published in peer-reviewed academic journals including Scientia and the International Journal of Education and Social Science. To apply for a SOC 4V70 Research Course, click here. The Center for Community Research and Development (CCRD) manages all of our active polls online through the cloud-based Sona internet platform. The Sociology department subject pool website is located at: https://socsc.sona-systems.com. Please see below for a few brief instructions explaining how to register for and use the Sona website. Student registration is currently available only to registered Baylor students. New research participants (students) can create an account on their own by clicking on the “Request Account” option at the right portion of the log-in web page, and providing the required information. Please remember to indicate the Sociology class in which you are currently enrolled from the drop down menu when registering, as several Sociology classes have research requirements specified by the instructor, and all of these are organized by this website. Participants can then sign up for research studies and view their schedule and records by signing onto the website. After signing in, participants can click on "Study Sign-Up." This will take them to the list of available polls, which are organized by date. All studies take place in the CCRD, located in the Leuschner Building on the second floor. After signing up for the experiment, it will be visible under the "My Schedule" menu option. If students wish to drop out of a poll they have signed up for, they can do so by clicking the cancel button next to the appropriate poll under the "My Schedule" menu. Sessions must be dropped 24 hours prior to their scheduled time to avoid receiving a "No Show," which may negatively impact a student’s course credit requirements. If participants attend their scheduled session, they will subsequently receive credit for participating. This credit is called a "Show." If they do not attend, they will receive a "No Show." “No Shows” are added to the participant's record, and will be included on the final report to their instructors. Participants can keep track of the number of "Shows" and "No Shows" they have obtained by referring to their participation information once they have signed in. If participants have a valid reason for missing an experiment session, they should contact the researcher in charge of the experiment whose email address is listed at the bottom of the Sona sign-in portal. Often, sessions can be rescheduled so as to avoid a no-show.